The Dodge Company has been fortunate over the years to have had leaders with vision and an eye for what is truly important. From the early years with the establishment of schools to teach the science of embalming, to the more current introduction of formaldehyde-free chemicals, Dodge has led the way. We are proud of this history and grateful to everyone who has helped to make this record possible. The following is a sample of the many contributions made by family members and associates over the past 120 years. In the early days of embalming, the only way companies could sell embalming chemicals was to train people to embalm and then sell them the product. A. Johnson Dodge started out that way but knew that having a school would give him, and the company, more credibility. So, in 1893 he and his brother bought the Oriental School of Embalming. In 1907, he and his brother parted ways and A. J. founded the New England Institute of Applied Arts and Sciences. (Photo to the right is one of his early classes.) 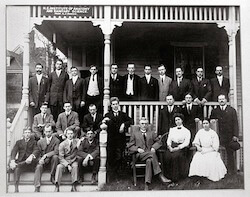 While the Dodge family has remained keenly interested in what is now called the New England Institute at Mt. Ida, the school and the Dodge Company have not been affiliated since 1910. At that point, the school was chartered by the Commonwealth of Massachusetts and became a non-profit educational institution. The strong interest and commitment to education remains and while the company hasn't been involved in owning and running a school since 1910, we have sponsored educational programs all over the United States and Canada since that time. Early programs were often presented in conjunction with local casket companies and were typically one day long. Those programs evolved into the Dodge Seminars which were created to provide a forum for embalmers and funeral directors to hear excellent speakers, see demonstrations from leading embalmers, and to share ideas and experiences. These have been attended by thousands of embalmers and continue to attract professionals from all over the world. Please see any current offerings in the Dodge Seminars section of our Web store. 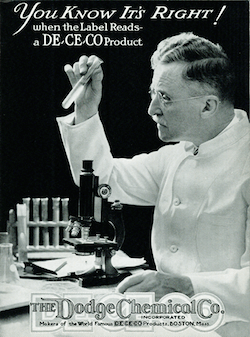 In order to guide the relatively new science of embalming, Dodge was the first to include a chemist on staff in 1926. The addition of a chemist with a lab to conduct research was the beginning of a period of rapid growth and learning. Many product innovations can be traced directly to the work completed in our labs. Some of the more recent innovations are products that make embalming easier on the embalmer through lower index and formaldehyde-free products like Freedom Cav, Freedom Art, and Viscerock FF (formaldehyde-free). In addition to the work the chemists do, our research and product development teams are always trying to think of additional ways to make the life of an embalmer easier. Over the past decade, some of our most notable innovations have been the Dodge APC Embalming Machine and our Waterless Aspirator.